Upon arrival in Hanoi, Vietnam. A warm welcome by our guide, transfer to restaurant for Lunch. After tour, we will transfer to Ha Long Bay. Dinner at local restaurant before go to hotel for check in. Overnight Ha Long Bay. After breakfast. Transfer to the pier to take a boat trip to visit Ha Long Bay, the World natural Heritage, which was fully agreed by all deligates at the UNESCO conference held in Bangkok in 1994. Visit Thien Cung Cave, Dau Go cave. Lunch with seafood on cruise. Visit the majestic Halong Bay which naturally formed with multi-shaped islets. Back to the shore and transfer to Ha Noi, visit Bat Trang pottery village. Dinner at local restaurant (French food), enjoy a water puppet show. Overnight in Hanoi. After breakfast, visit Ho Chi Minh mausoleum, Ho chi minh museum, One Pillar Pagoda- the fantastic architechtural style in the lotus shape, Temple of Literature. Lunch at local restaurant (including: Cha ca… ) Continue visit: Hoan Kiem Lake, Ngoc Son temple, ride on electricity car arround 36 old street. Dinner at local restaurant in early time (including: Bun cha..). Go to airport for flight ( departure around 19:00-19:30) After arrival transfer to Hoi An. Overnight stay in Hoi An. Breakfast at hotel. 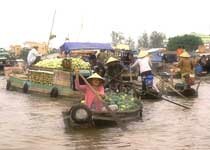 Visit: Hoian ancient town, fouded on the 16th century by Chinese and Japanese businessmen. Visit Phuoc Kien temple, Tan Ky old house, where keep many ceramic antiques. Explore the special architectural style of Bridge pagoda. 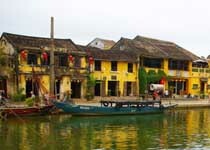 Visit Hoi An old town found 16 th century. Go to Danang visit: Marble Mountain, Cham museum. Lunch at local restaurant. Go to Hue . Dinner at local restaurant for Royal decorated menu. Overnight in Hue. ** Royal Music show is included for group from 8 pax or above. Breakfast at hotel. Take boat trip along the Huong river visit Linh Mu Pagoda, on the Ha Khe hill, one of the typical symbol of Hue city with the Phuoc Duyen Tower quietly stands on the side of the river, stretches its shade into the water. 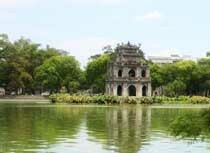 Continue the tour to visit King Minh Mang tomb. Then take a tour to King Khai Dinh tomb. Emperor Citadel of the Nguyen Dynasty. Step by step explore the history of Viet Nam under the reign of Nguyen Kings, how can they build the citadel, why they must be in that shape and many interesting stories. Visit the South Gate, places and many historical sites. Dinner at local restaurant. Overnight at Hue. Go to airport for flight (departure in the morning), after arrival go to Cu Chi. Lunch at local restaurant . 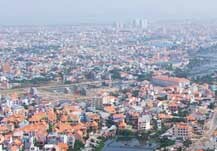 Visit Cu Chi tunnel, back to Saigon for check –in hotel. Dinner Cruise on Saigon River. Overnight in HCMC. Arrival at My Tho, take a boat trip on Mekong river, then visit coconut candy factory. Then take a car horse or motor-car around the village (the horse or motor with cabin behind can carry 4 or 5 persons), visit a garden house and taste bee and tea, then enjoy fresh fruit, listen to nice performance traditional music. Take a rowing boat back to the river, have lunch with typical food. After lunch, transfer by car/bus to Hochiminh city. Dinner at local restaurant. Overnight in HCMC. After breakfast at the hotel. Transfer to airport for onward flight back to USA or fly to other Asia Destination. AsianaAirline(OZ) Cathay PacificAirway(CX) or Eva Airway (BR) or China Airline (CI) Free Vietnam Landing visa approval Letter : when the tour fee is pay in full before 30 days of departure. (Customers only need to provide the approve letter from Vietnam Embassy(provide by us) with Passport, one photo, USD$25, apply at Custom when entering Vietnam airport。 p.s. When Booking is made less than 30 days, USD$ 25 service fee is need to be collect here is USA, and Customer still need to bring the approve letter from Vietnam Embassy(provide by us) with Passport, one photo, Stamp fee of USD$45 for single entry or USD$65 for multiple entry( pay by customer), apply at Custom when entering Vietnam airport。. Accommodation in hotels as indicated with Breakfast. Regional Chinese or English speaking guide on travelling days. Sightseeing and entrance fees as indicated in the itinerary on traveling days. *Rate Based on min. 6 pax. Surcharges will be applires when less than 6 pax.